A United States census found the Bronx to be the most ethnically diverse area of the country. While the Bronx has undergone enormous strife and economic difficulties since the mid to late part of the 20th Century, it has since risen back and begun to blossom as a culturally rich borough of New York City. As the Bronx becomes more and more culturally active, people are flocking to this borough to take part in film screenings, boutique openings, business endeavors, and more. New York Limo loves being part of the wide range of cultural celebrations the people of the Bronx enjoy. From quincineros parties to multicultural weddings to religious events, we have played a role in these important life events taking place in the Bronx. We are dedicated to making your event special by providing first class service that will help to make your day memorable. 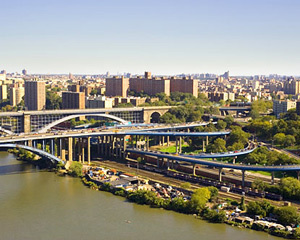 As the only borough of New York City that is located mostly on the mainland, the Bronx is the northernmost of the boroughs and can be difficult to navigate for those unfamiliar with the area. When you hire a New York Limo, it's like having a local taking you through the streets of the Bronx. While you're there, visit the Bronx Zoo, take in an off-Broadway play, check out the newest hip hop venues, or head over to the Bronx Museum of the Arts. Yankees Fans flock to the Bronx during baseball season. With Yankee Stadium open in full force during the summer months, the Bronx truly comes alive. Our New York Limos make the trip from the other boroughs easy and fun. Why stress about any part of game day? Enjoy a cold beverage and sink into our sleek leather seats, and our driver will get you to the game in time to get a hot dog before the first inning.